I get one or two e-mails a week from someone who's discovered the donation page on dansdata.com, and immediately decided that all I do is beg for money. Sometimes they ask me what my secret is. Sometimes they ask me for a cut of the (presumably massive) take. Sometimes they try to get me to join some questionable scheme, or just send me a PayPal money request. And sometimes... well, sometimes I get something like this. So... "K" is in the rocks-that-totally-look-like-faces-or-something business, I guess. K's unusual form of expression suggests to me that his world-class collection of rocks that look like things may not actually be quite as world-class as he believes. What you might foolishly mistake for a stone the size of a softball with a hole through it is actually a "distinctive human face/skull", and an "impressive show piece with its dazzling detail and endless enchantment". With a price tag of £795,000! It doesn't tell us who's ever paid 96 megayuan (or twelve million pound-dollars) for this paperweight, though. This remarkable story also appears, for the last five years, to have escaped the notice of the rest of the world's news services. So has the "China Rare Stone Expo" at which the remarkable rock was supposed to have been exhibited; that seems to only be mentioned in reprints of the story about the near-priceless grandma-rock. I fearlessly predict that if anybody clicks the Buy It Now button on the £795,000 eBay "skull" listing, that person will run giggling out of the auction-room as soon as they're asked to pay up. Perhaps I should advise my correspondent to try selling "haunted" or other "magical" things on eBay, rather than sets of all-natural Hitler/Madoff book-ends. 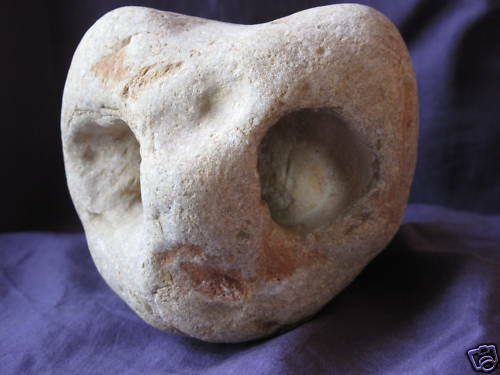 Hmmm, I have this clearly supernatural sandstone sphere I found in a sacred Maori riverbed...I bet I could sell it for at least 50,000 pound dollars! Damn. To think of all the stones I skipped across a lake. I could be rich! Rich beyond my wildest dreams! Then I wouldn't have to consort with you unwashed, heathen peasants anymore. But I was young and foolish, and now I'm a broken, bitter old man. I wasted my fortune. Weep for me. Or maybe I should just laugh about those idiots who think that some ordinary rock is worth a bunch of monies. Similar but different: look at the (Aus) prices for jewellery. Specifically, gold. Gold chains of 12 carats (50% gold) to 18 carat (75% gold) are priced as if they're made of 24 carat gold. Confront them and they all claim "nobody wants to buy 24 carat gold"
You can compare this to drug dealers, "cutting" their product to stretch their profits. Have you ever handled 24 carat gold Alan? Yeah, 24 karat gold makes great jewelry. Oops, my necklace just broke under its own weight, but at least it's 24 karat! I have a rock that keeps tigers away. « Are you troubled by yellowed, lifeless Lego?